This past fall we started building a path through our woods to the back 15 or so acres that is up on top of a ridge; the area back there is park like and beautiful. Problem is, we have to cross a couple of MASSIVE ravines to get there. We’ve almost conquered that project and I’m sure I’ll be writing a ton more about it later. 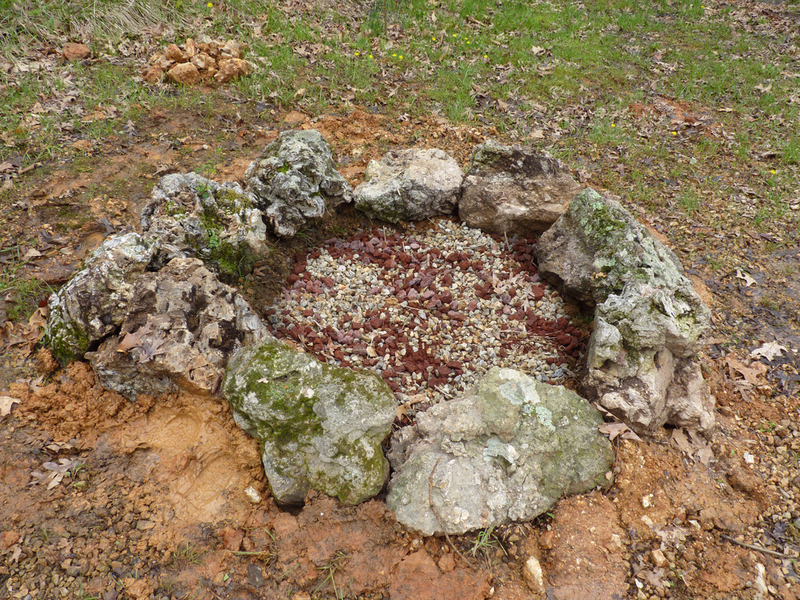 As usual, one project leads to another where the yard is concerned- clearing the path through the woods spawned the fire pit idea. 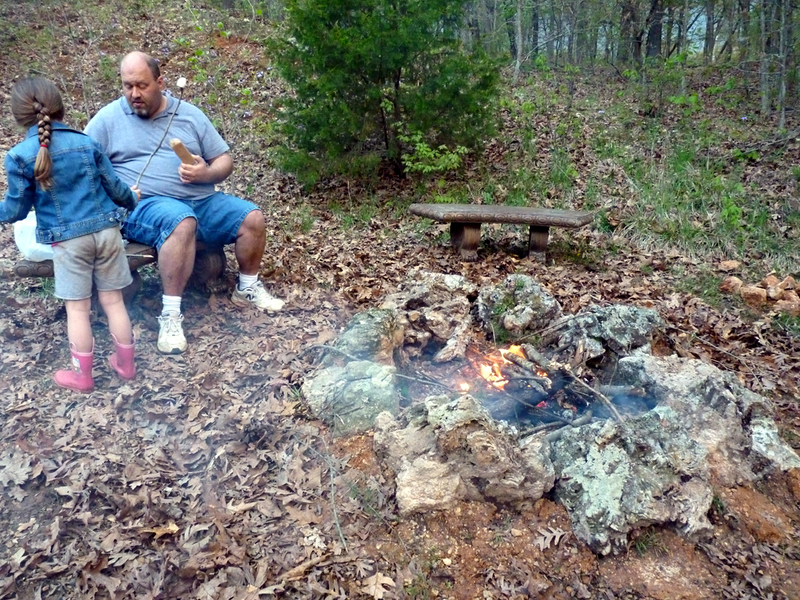 Mister wanted a spot in the yard where we could all sit around and have Smores, sing Kumbya or whatever else you do around a campfire in the woods. (No, there are children present. Get your mind out of the gutter) We do not dance naked under the full moon during the Solstice; I have neighbors. So we put this boulder in the yard and it looked lonely. We brought it a friend. They were sitting by the edge of the woods around spot where water always puddles and made a little hole. 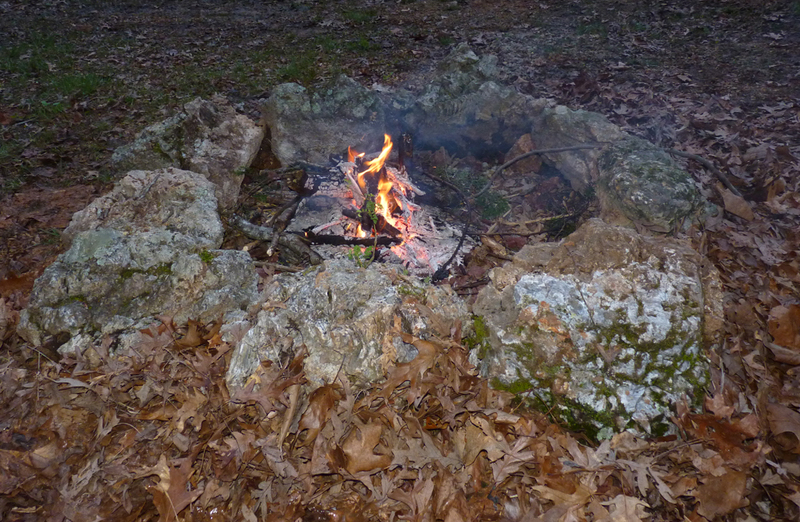 I was sitting and looking at them when it clicked- Oh My Dear Gods and Goddesses- I could build a fire pit, out of nothing but huge, gorgeous rocks!!! We managed to bring up just a couple before we got distracted by the path through the woods, then deer season happened, then winter. A couple weeks ago, we started boulder hunting again. 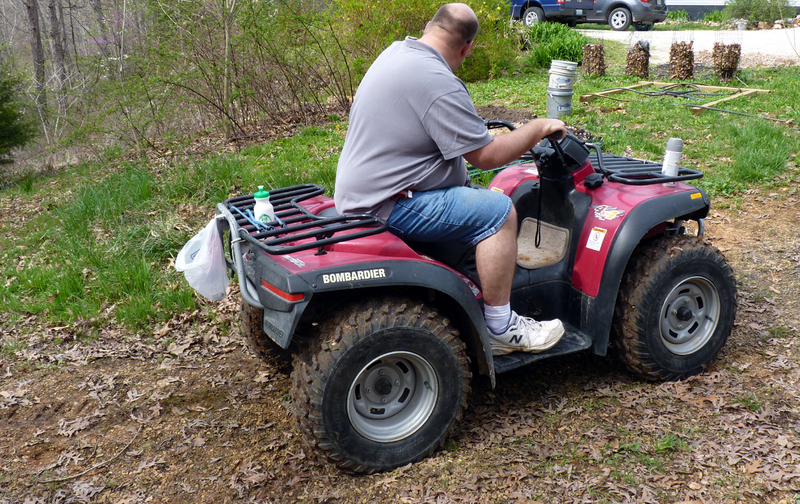 Our land is typical Missouri hills and valleys, which means both neighbors’ property drains into the valleys, creating little wet weather creeks and an abundance of really cool rocks to find. The next several rocks we moved fairly quick and without incident. 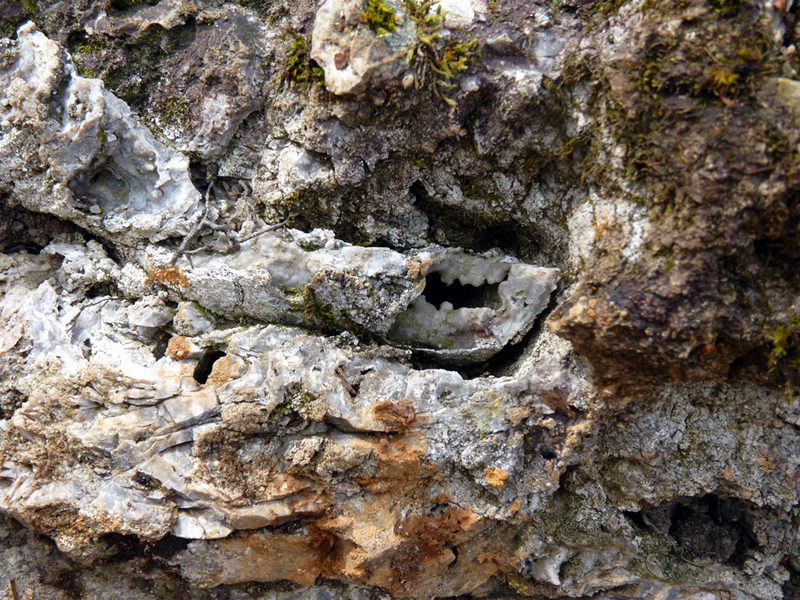 They were all really beautiful- worn by water from the ravine, most of them with small plants/moss growing on them, some with visible geodes and fossils in the surface of the rock. The next to the last broke as we were lifting it, causing me to drop it on his thumb (thankfully he was wearing thick gloves and avoided serious injury). I didn’t realize I had also tried to catch the rock with my stomach as it fell, until I felt something sting, lifted my shirt and found a 6 inch long gash where it had ripped me open. Luckily, not deep enough to need stitches. Unluckily, I was still getting bits of rock and dirt out of the wound two days later. The actual building of the pit was super simple. We live in central Missouri and 99.9% of my earth here is either pure red clay, rock, or some combination of the two. In the spot we wanted the fire pit, it was all clay. It’s been raining here for almost a month solid now, so the clay is really holding some serious water. Imagine putting a 10 lb bag of wet sand on the end of your shovel. Now imagine that it also sticks to your shovel like a booger on a kid’s finger. That’s wet clay. It’s impossible to shovel in. 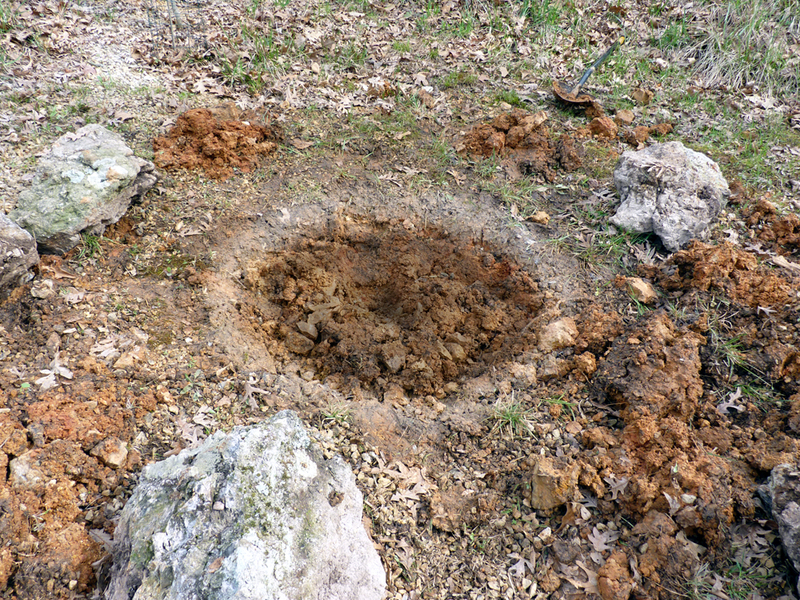 Mostly I just loosened up chunks of earth, then got my hands in there to get the globs out of the hole. If you’re working in actual dirt or sand, you should dig a hole and then line it with some sort of fire-proof stone- be it brick, cement blocks, big rocks, whatever material suits you aesthetically and will keep the soil from falling back into your hole. I am in no danger of that clay going ANYWHERE. It molds like modeling clay when wet and gets hard as cement when dry. It can crumble a bit in that state, but by the time it dries out this structure will have been there a while. 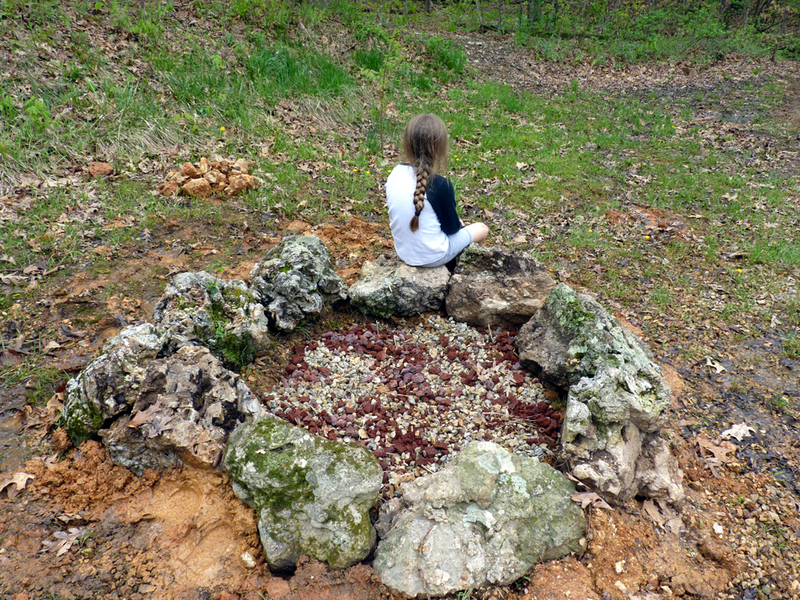 I painted a circle on the ground with spray paint and dug out about 6-8 inches below the boulders. This gives your wood a nice hole to sit in so that it’s contained and doesn’t blow sparks everywhere from each tiny breeze. Since I’m dealing with saturated clay, my hole immediately filled up with water in the bottom. The edge was so mushy, I only had to roll the boulders into place where I wanted them an d press down a bit to sink them into the ground. Had it not been so wet, I would have dug a shallow trench around the outside of the hole. I wanted the bottom 3-4 inches of each boulder to be underground. If you were laying a course of bricks or cement blocks, you’d do the same- bury your bottom course partway in the ground. The nice thing about using boulders instead of landscaping bricks or blocks is it is a very natural, informal look. I didn’t have to worry about leveling each course or lining things up. I just maneuvered them in like a big jigsaw puzzle until I liked the way they looked. 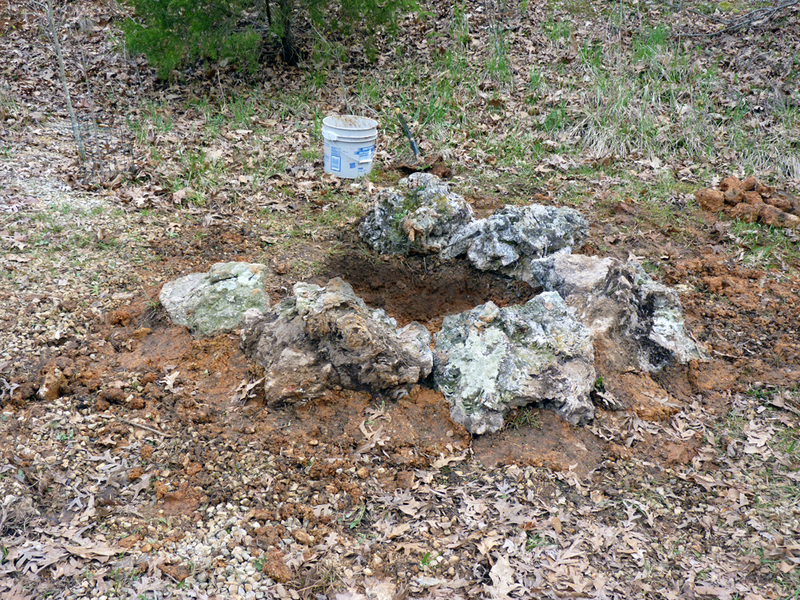 Once the rings of boulders was in place, I took all the mud I’d removed from the center of my hole and pressed it around the base and between the boulders to settle them in. I’ll later put some sort of groundcover around the outside of this; maybe red clover or thyme, something low growing and tolerant of foot traffic that I won’t have to weed-eat all the time. Since the bottom of the pit was standing water, we took some gravel from an old part of the driveway to give the wood something dry to sit on. I threw part of a bag of lava rock on top of that, just for looks. I’ve seen people use all gravel, recycled chunks of glass, pottery, all lava rock… really it’s just about finding something that looks nice to you. We had some old concrete benches sitting up by the highway that we hadn’t used since that shed was an office. We brought those down (along with a small ant colony) and set them up- they are fireproof and I don’t have to worry about them rotting in the mud over there. I’m hoping to add more seating soon, maybe a picnic table and some sort of more permanent path over to that area at some point. It’s right next to the where I’m putting in a new vegetable garden, so it will develop along with that plan. This is NOT a project you’ll be doing by yourself, unless you use much smaller stuff for the walls of your pit. Once we had all of our rocks, it only took about 3 hours to put it all together and have it ready for first use. Garden and/or sidewalk will be coming soon. I’ll keep ya posted! 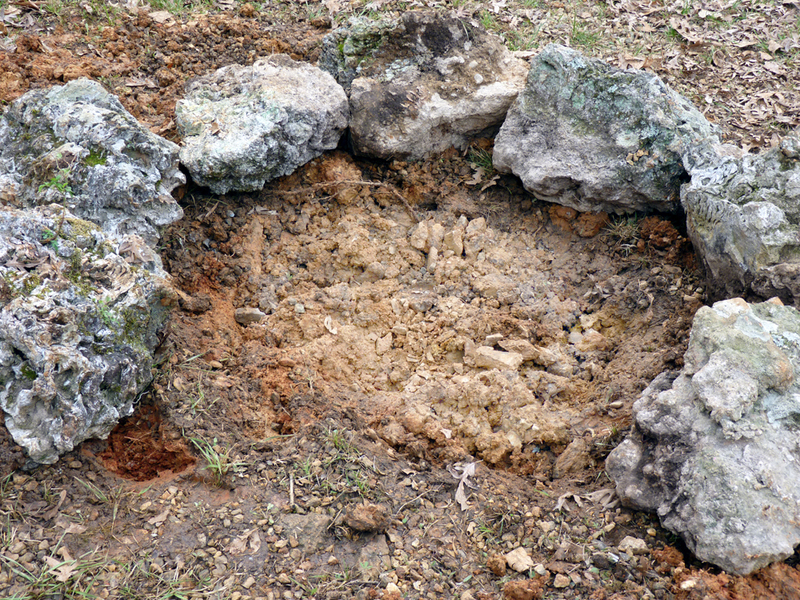 Categories: Uncategorized | Tags: belle of dirt fire pit, boulder fire pit, buiding a fire pit, campfire pit, diy firepit, fire pit, firepit, Lake of the Ozarks, landscaping lake ozarks, natural fire pit, ozarks landscaping, permanent campfire, smores, smores over campfire, yard campfire | Permalink.